Notes: Once again Behringer broke the affordability barrier - with the new ULTRALINK ULM300MIC Wireless Microphone System, which includes 1 of their high quality ULM300M handheld mics - and the equally-impressive ULM300RS single-channel receiver. Now you are free to work the room to your heart's content, without the hassle and restriction of cables underfoot. 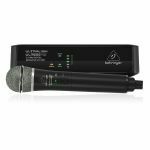 Highest-quality sound is provided by the custom-designed microphone capsule that is optimized for vocal performance, and the built-in transmitter that operates in the license-free 2.4 GHz range. Behringer's state-of-the-art transmitter operates in the 2.4 GHz frequency band, which is well out of the way of TV stations and cell phone towers. And since it is digitally encrypted, your signal gets through in all its pristine, high-definition quality, without the random artefacts that often plague other wireless systems. The ULM300RS single-channel receiver tracks your every move, with a range of up to 200 feet (60 m). Replacing batteries in wireless mics can get expensive really fast - and having them die in the middle of your set can be a real showstopper! That's why Behringer have devoted extra time to developing the ULM300MIC to ensure that battery life was extended as much as possible. You get an honest 24 hours of performance time from a pair of AA alkaline batteries, which are available virtually anywhere on the planet. Setup couldn't be easier, because the ULM300M mic automatically pairs with the ULM300RS single channel receiver - without you having to lift a finger. Convenient front-panel LEDs on the receiver show your signal presence and strength, while indicators on the transmitter let you know at a glance when it's time to change batteries. Audio outputs are balanced XLR and unbalanced 1/4" TS, allowing you to connect to PA and conference room systems or high-quality instrument amplifiers. Behringer wanted the ULM300MIC to be ultra-easy to operate, so they gave each mic easy-to-understand and operate Volume buttons right on the microphone body. And should you accidentally wander into the "Feedback Zone", they included a handy Panic Mute function that engages when you press and hold the Volume Down button. Operating in the 2.4 GHz band allows your ULM300MIC Wireless Microphone System to be used across the globe without any special licensing requirements. Notes: Receiver unit is compatible with standard 19" racks using the included rack ears and front mounting antenna accessories. Available with either a handheld microphone or bodypack transmitter. The ultimate freedom to perform is within your grasp. The VHF-01 single-channel wireless system offers crystal clear clarity, exceptional sound quality with many more added advantages for the best price in the market. Embrace the freedom from dangling wires and limited mobility. Perform to your heart's content to impress the audience with energy. The top-notch technology featured in the VHF-01 single-channel wireless system is unbeatable. The dual configuration mechanism that is ultra-versatile offers you the opportunity to use any of the prevailing applications in the industry without a hassle. The hardware component of the VHF-01 single-channel wireless system comprises of a unidirectional microphone. This mic features an ultra-sensitive cardioid capsule that plays a key role in reproducing voices. This is not the only reason that makes the VHF- system perfect for singers, DJs, and others who require a high-quality voice amplifier. Special inbuilt noise absorption techniques available in the mic help to deliver a clear and undisrupted voice to the audience. This is why our product is trusted by renowned artists, public speakers, audio service providers, DJs, presenters, lecturers and many other professionals throughout the country. One of the key features of the VHF-01 system is its superior quality (single channel) VHF receiver with a 100-feet operating range. This microphone system stabilizes within the frequency range 170-260 MHz. The output level is optimized with the single channel volume rotary control mechanism to provide an unbeatable experience each time you make use of this dynamic single-channel wireless system. Monitoring the signal strength of the sound is not an issue because of the straightforward super bright RF LED indicators that indicate the signal strength for your convenience. In addition, the standard 14-inch unbalanced output jack makes it even easier to use the VHF-01 system wherever you go whenever you need. 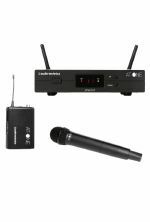 Make your next public appearance on stage a better experience for yourself and your audience with the top-notch VHF-01 single-channel wireless system. 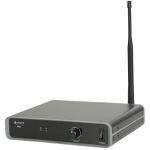 Notes: A dual channel VHF wireless microphone system with a half-width 1U receiver and 2 handheld transmitters. 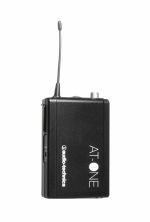 Notes: Handheld wireless microphone as alternative or replacement for QTX portable PA units. Available in VHF for QRPA and QXPA or UHF for QXPA-plus. Notes: A VHF wireless microphone system with a half-width 1U receiver, a belt pack transmitter, and a lavalier tie-clip microphone. Notes: Neckband microphone with beltpack transmitter as alternative or replacement for QTX portable PA units. Available in VHF for QRPA and QXPA or UHF for QXPA-plus. Notes: RODELink represents the next generation of digital wireless systems. Using a series II 2.4GHz digital transmission with 128-bit encryption, it is able to constantly monitor and hop between frequencies to maintain the strongest possible signal level at a range of up to 100 metres* (over 100 yards). The RODELink Newsshooter Kit provides everything you need to start shooting video wirelessly with XLR microphones, including a camera-mounted receiver and an XLR transmitter. The receiver (RX-CAM) features an OLED display with information on level, battery status (receiver and transmitter), mute and channel selection. The unit can be mounted on a standard camera shoe mount, 3/8" thread or belt-clip, and for added versatility the shoe mount can be located in one of two positions. The transmitter (TX-XLR) easily connects to handheld presentation microphones as well as shotgun microphones, with a 3.5mm input and headphone output. Notes: Take The Worry Out Of Wireless. Notes: Samson's Synth 7 Guitar Wireless System delivers the performance and features normally reserved for more expensive systems. The system's all-metal receiver and transmitter each feature a user-friendly LCD display for superior performance monitoring. Also including an auto frequency spectrum analyzer, 100 channel options, a 300' wireless range and Samson's GC32 guitar cable, the Synth 7 Guitar delivers high definition sound and professional UHF wireless performance at an unbeatable price. Synth 7's UR7 Wireless Receiver was designed with dark stage environments in mind. Unlike hard-to-read dot matrix or simple backlit displays on other wireless receivers, Synth 7 features a bright full-color LCD that allows you to clearly monitor settings such as transmitter battery life, receiver volume level, RF signal strength and operating channel. The display enables faster setup and allows you to lock your settings to avoid performance interruptions. Since 1980, Samson's mission has been to take the worry out of wireless. Synth 7 honors that goal with its 1-touch auto frequency spectrum analyzer. This tool not only selects the optimal operating frequency for a given location, but it provides a full readout of the RF spectrum for a clear picture of your specific wireless environment. In addition, Synth 7's IR Set allows you to wirelessly sync your transmitter to the receiver's operating frequency. Samson's all-metal UB7 Beltpack Transmitter comes with Samson's GC32 guitar cable, featuring a locking connector. Complete with its own LCD for monitoring battery life (up to 15 hours on two AA batteries) and current operating channel, the UB7 was meticulously crafted to meet the demands of serious performers. Synth 7 counteracts interference from unlicensed white space and other stray RF signals. An adjustable Squelch control sets the threshold level of the receiver's reception sensitivity, ensuring unwanted RF signals go unnoticed by your audience. Also, a pilot Tone Key blocks invading signals when your transmitter is turned off or out of range. Finally, the system's true diversity circuitry effectively eliminates multi-path interference. Notes: The Beta 58A dynamic vocal microphone is precision-engineered for live performance and project studio recording. A tailored frequency response accentuates vocals, and the supercardioid pattern isolates from other sound sources. It combines automatic frequency management with true digital diversity for a rock-solid wireless signal with exceptional digital audio clarity. Notes: The BLX24/PG58 Handheld Wireless System is part of the handheld wireless systems family. Shure BLX Wireless Systems combine professional-quality sound with simple setup and an intuitive interface for legendary audio performance right out of the box. Precision-built and available in a variety of configurations, it's the most accessible way to own the stage. Includes BLX4 single-channel receiver, PG58 handheld transmitter, microphone clip, power supply, 2 AA batteries, and user guide. Notes: The SM Wireless Vocal System with SM58, an industry-standard, highly versatile cardioid dynamic vocal microphone, tailored to deliver warm and clear vocal reproduction combines simple setup and an intuitive interface for performance you can trust in. The SM58 is an ideal choice for a professional vocal artist in any live performance setting. It is tuned to accentuate the warmth and clarity of lead and backing vocals. Even in extreme conditions, the SM58 is tailored to target the main sound source while minimising background noise. It is also very popular with djs and presenters in clubs and in small and large live venues. With durable construction, a proven shock-mount system, and a steel mesh grille ensure that even with rough handling, the SM58 will perform consistently, outdoors or indoors. The SM Wireless Vocal System comes with the Analogue Wireless Receiver BLX4 that provides improved linearity and frequency response. The BLX receiver is ready to perform right out of the box and is a great choice for performers who wish to unplug from the wire. It's also available as a rack-mountable, metal receiver and Dual Receiver. Notes: The Shure GLXD24UK/B58 features the leading-edge LINKFREQ automatic frequency management system alongside lithium-ion rechargeable technology and digital radio transmission- providing outstanding vocal reproduction combined with top quality wireless connectivity. Equipped with the Beta 58A super cardioid microphone capsule, the GLXD24UK/B58 system is designed for close vocal work and captures vocals with definition and tone whilst rejecting unwanted off axis noise. Tried and tested, the Beta 58A capsule has been proved to offer not only outstanding audio quality, but gig hardy reliability- show after show. Seamless and dependable wireless connectivity is provided thanks to the intelligent GLX-D digital radio system. Once the transmitter and receiver are switched on, the system auto-scans for the best available radio space and then automatically links both units to the best available frequency. If any interference occurs, the system cleverly shifts both transmitter and receiver to a clear frequency, avoiding disruption to the performance. The GLXD2/B58 handheld transmitter features a durable, lightweight design and can deliver digital audio clarity at a range of up to 60m in line of sight from the receiver. Shure lithium-ion rechargeable batteries offer convenience and the ability for 16 hours continual usage and can be charged from a USB port if required. The GLXD4 single-channel wireless receiver features the revolutionary LINKFREQ automatic frequency management system ensuring minimum disruption to connectivity when faced with interference. The GLXD4 features a charging port, allowing the GLXD2 transmitter battery to be recharged when the receiver is powered. For intelligent digital connectivity and audio quality, with the trusted Shure Beta 58A vocal definition, the GLXD24UK/B58 is the perfect solution.